Dr. Gachet Van Gogh’s painting was written in 1890, shortly before his death. Gachet was a friend of the artist. As a doctor, he supported him for the rest of his life and monitored his condition. 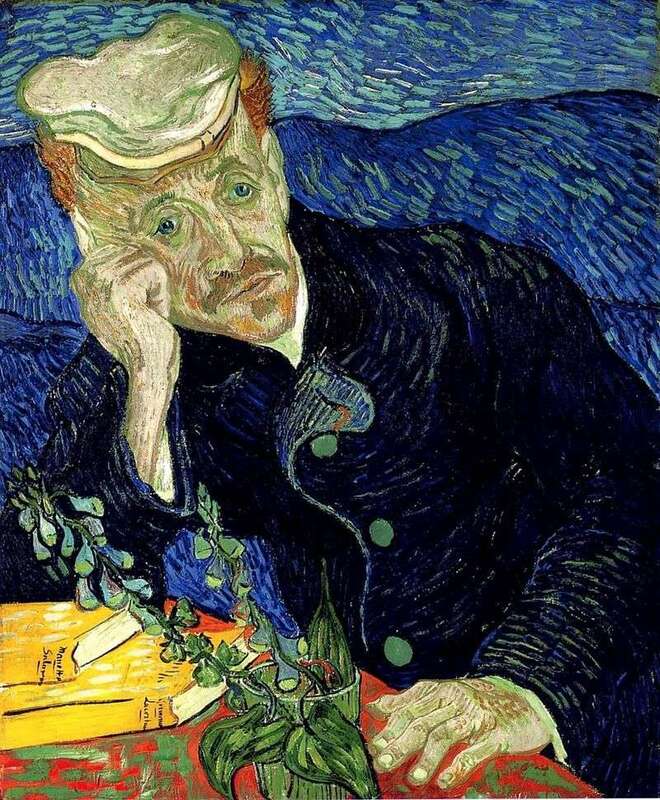 But, like Van Gogh himself, Gachet was also prone to melancholy and melancholy. The artist was struck by the fact that, as a doctor, his friend could not cope with heart disease, and suffered from it, despite all his knowledge. Gachet is depicted sitting in a sad pose full of anguish. Supporting his head with his right hand, he holds a bouquet of foxglove in the left. These flowers have always been considered a symbol of heart problems. His figure in a dark coat seems to be completely devoid of tone. Thin wrists, thin, wrinkled face – everything indicates the condition of the doctor. But most of all, this is evidenced by his gaze, in which sorrow is expressed. At the same time, he looks carefully at the artist, and his eyes radiate sincere warmth and participation. Melancholy is expressed in the color scheme of the picture. For the background, the artist chose the blue color, which is a symbol of sadness. The painting is written in the usual manner for Van Gogh, with the help of imposing long strokes. This is one of the most famous paintings by Van Gogh. Sincerity and penetration make it a masterpiece of world painting. Description and meaning of the painting Portrait of Dr. Gachet II by Vincent Van Gogh.